All disease begins in the gut. Hippocrates said this over 2000 years ago, but it’s only recently that we’re really coming to understand just how right he was. And it makes perfect sense. Not a single cell in the human body can be nourished and function properly if the digestive system is malfunctioning. We like to use the phrase ‘you are what you eat.’ But that’s actually not true. We are what we digest and absorb. And we can only absorb something if we digest it and if our digestion is broken, we’re not absorbing the nutrients needed to stay healthy. There are two closely related factors or variables that determine our gut health: the microbes in our gut, or gut bacteria, and the lining of our gut, or gut barrier. Our gut bacteria help us digest our food, regulate our immune system, protect against other bacteria that cause disease, and produce vitamins. Ideally you want a diverse group of bacteria comprised of about 85% good bacteria. The lining of our GI tract, which is only one cell thick, is where 2/3 of our immune system is housed. This gut lining is critical for separating the good (nutrients) from the bad (toxins and foreign invaders). An imbalance in our gut bacteria (microbial imbalance) and/or damage to the lining of our gut (known as intestinal permeability or leaky gut) will lead to inflammation and disease. If you have a leaky gut, you probably have bad gut bacteria, and vice versa. Antibiotics are particularly harmful to the gut flora. And while leaky gut and bad gut flora may manifest as digestive trouble, in many people it does not. Instead it shows up as problems as diverse as heart failure, depression, brain fog, eczema/psoriasis and other skin conditions, metabolic problems like obesity and diabetes and allergies, asthma, and other autoimmune diseases. To adequately address these conditions, you must rebuild healthy gut flora and restore the integrity of your intestinal lining. This is especially true if you have any kind of autoimmune disease, whether you experience digestive issues or not. Improve your diet – eat plenty of plant foods and stay away from highly refined processed foods. 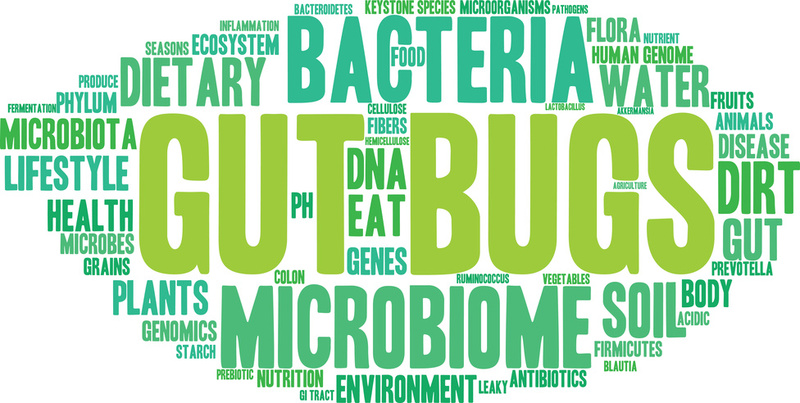 * You always want to think of the gut as a likely source of chronic mood/neurological issues. Over 90% of our body’s serotonin is made in the GI tract, so gut health is key to producing enough serotonin – a neurotransmitter responsible for controlling mood, sleep, and appetite regulation, among other things. Fifty percent of our body’s dopamine is made in the gut. Dopamine is another neurotransmitter which manages our ability to focus, learn new habits, control our muscles, and have good memory. Inflammation in the gut can inflame tissue in the small intestines and affect whether or not our body makes serotonin and dopamine effectively.